28 October 2017 Pressure Cooker. 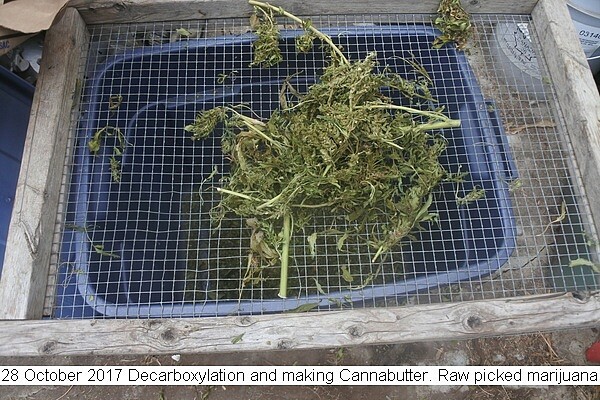 Decarboxylation of Marijuana. http://durgan.org/2017/October%202017/28%20October%202017%20Decarboxylation%20of%20Marijuana%20using%20Pressure%20Cooker/HTML/ Decarboxylation of Marijuana using Pressure Cooker. Experimenting with decarboxylation of raw marijuana material it was decided to use the pressure cooker. The internal temperate reaches 240 F almost ideal for decarboxylation. Four batches convinced me the technique worked. How well? Procedure. Pick the marijuana material. Trim away the larger leaves and stems. Loosely stuff the end product into liter jars. Install canning lids. Place in Pressure Canner and cook for 15 PSI for one hour. Let cool. Store in refrigerator. Use as required. No rot or mold can take place since inside of the jar is pressure steamed vacuum sealed. This entry was posted in Uncategorized and tagged Decarboxylation of Marijuana, Pressure Cooker. Decarboxylation of Marijuana, Pressure Cooker. Marijuana. Bookmark the permalink.